Home » Politics & Public Affairs » Ontario Politics: Top Issue and Should Kathleen Wynne call an election? Ontario Politics: Top Issue and Should Kathleen Wynne call an election? 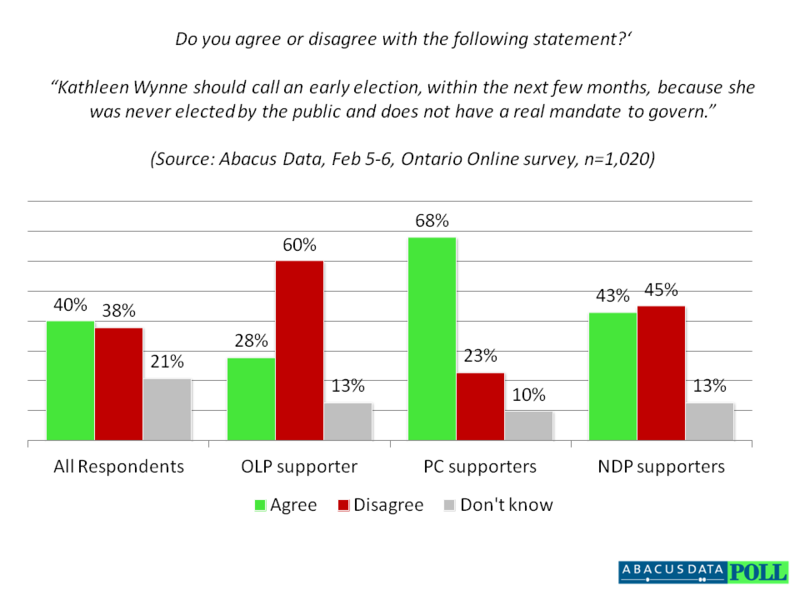 Ontarians split on whether Kathleen Wynne should call an election. A new provincial survey released by Abacus Data found that jobs, the economy and related issues are the most important issues to voters in Ontario as Kathleen Wynne forms a new government. Liberals and Progressive Conservatives alike expressed concerns surrounding job creation, the economy and provincial debt levels, while NDP voters were less likely to focus on a single issue. Progressive Conservative supporters were most likely to say that the provincial deficit and debt was the most important issue facing Ontario (25%) while Liberal and NDP supporters were more likely to mention something about the provincial economy. Highlighting Ontario’s polarized political landscape, 40% of Ontarians agreed that Kathleen Wynne should call an election to get a mandate from Ontarians while 38% percent disagreed that an election should be called. Twenty-one percent were unsure. Politically, Liberal Party supporters were most likely to oppose the idea of an early election (60%), while Progressive Conservative Party supporters were most likely to agree that an election should be called (64% of Progressive Conservative supporters want an election). New Democrats were more divided – 42% want Premier Wynne to call an election while 37% do not want her to.